Help Jessica transform her aunt's failing old bakery into a complete success. Get Jessica's Cupcake Cafe up and running by attracting plenty of customers with delicious recipes and a hip atmosphere. Use your Time Management skills to earn as much money as you can, open up brand new shops, offer more tasty items, and upgrade your equipment. Keep the candy-coated cupcakes coming to please your clientele! 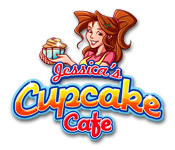 Jessica's Cupcake Cafe is rated 4.2 out of 5 by 17. Rated 5 out of 5 by katedail from Fun challenge I love this game so much I have played it a few times. It has a short story line. It's just easy enough to be fun, but challenging if you like to get "expert" aka gold for each level. You can also change the design of the cupcakes! 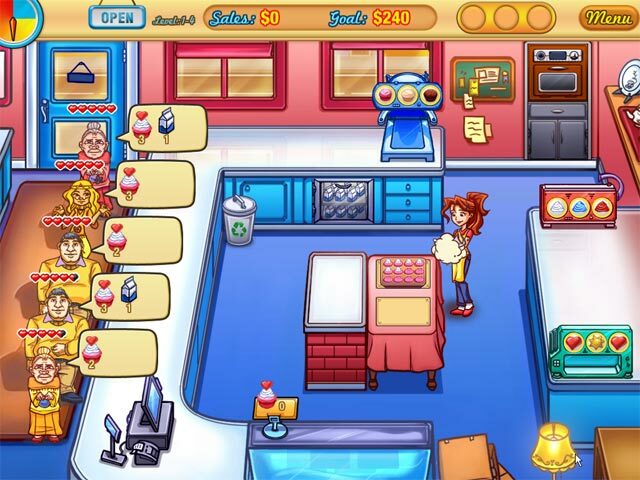 Rated 5 out of 5 by John_3_16 from Makes You Want to Own a Cupcake Shop Jessica's Cupcake Cafe is a wonderful TM game and one fans of Cake Mania will enjoy. 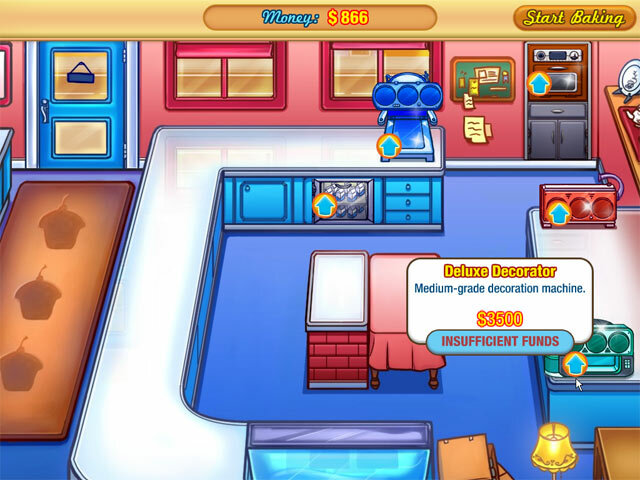 Like Cake Mania, it has the similar upgrades for ovens, decor, and TV. This game makes me want to open up a Cupcake Shop! Things I like: Not only do you bake the cupcakes, you choose the frosting and the toppings. You have the choice of two refreshments for customers, milk and water (with upgrades for both). Every Cupcake offers a recipe for you to bake yourself! That is a feature I wasn't expecting and was happy to see, it adds a touch of caring from the gamemakers to the players. You also get to design your own cupcakes. You have unlimited task clicks (unless you accidentally hit the wrong one, then they all disappear. Still, it's nice to line up directions.) Things I did not like: I wish the upgrades were a little more versatile (it would be cool to decorate the shop -- perhaps this will be added to Jessica's Cupcakes 2? ), the upgrades are fun at first but become redundant. I want more from the story line. I still have only a few levels left to play, so I don't know about the finale yet, but I would like a little more storyline scenes. For gamers who like less storyline, this is for you. Overall I love this game. I've been wanting a fun TM game and this offers fun with challenges - I look forward to playing it. Some might find it easy in the beginning but it does get harder. I have to replay more than one level because I need to come up with a strategy in order to reach the goal. If you buy this game I think you will find some delightful surprises not seen in other games (at least that I've seen so far). I recommend this game. Rated 5 out of 5 by kathleenhr from Fun game This was a lot of fun to play. A little challenging. It reminds me a little of Chocolate Shop Frenzy. Rated 5 out of 5 by hez2011 from TM Fun! This is an older TM game but still a good one. I found it to be challenging enough not to be boring but not so hard that it was stressful. It would be great to see a squeal to this game. Rated 5 out of 5 by Booklove2 from Nice Game not too repetitive This game was nice, it was very fast which I liked as sometimes you get bored in time management games just waiting for the level to be complete. This game changes cupcakes from day to day and you can even design your own. Recipes are also included which is cool. I liked the speed of the game after the oven upgrade it would make cupcakes in 3 seconds which was faster than any of the other instruments. Some things that I wish were better would be the upgrades they were helpful in the beginning but there should be more. At the last cafe.level I had done them all. Also you can play this whole game for free when you sign up for a member on this site then instant games, it gives you 7 days so you can complete the game in that time. I liked the option of changing the design the only problem was when you changed it it wasn't as easy to make the cupcakes as the two batters you needed would come from the same mixer so it was more difficult to get the cupcakes out. The speed was very high paced which I liked and it was challenging at times trying to make cupcakes while you have a line full of customers, that's why prep work is key. Fun game. Rated 5 out of 5 by adinastar from Fun! I love these types of games. I hope they make another Jessica's Cafe game. The game play is pretty simple and easy to follow. I really loved the cartoon, graphics and overall look. Rated 5 out of 5 by tweetybird_18428 from I love this game! I have had this game since 2009 and I have never gone to the end until recently. I've started over so many times! This is one of my favorite games! It does get harder at the end but I love the challenge of trying to get the goals done. It does take a while to purchase upgrades which I think is a great idea! Rated 5 out of 5 by LadyoftheIvy from Will make you wish you had cupcakes nearby! I tend to enjoy time management games a lot, even if they can end up seeming like they'd be repetitive. While you're basically spending each level filling people's cupcakes (and possibly drink orders), this one is neat in that you actually have to bake, frost, and decorate the cupcakes before you can even fill anyone's orders. And, before the level even begins, you can choose what sorts of cupcakes you'd like to offer for sale during that level. It's similar to the Cake Mania games except that people generally can't choose anything they want, they have to choose from the cupcakes you're offering. Frequently, at least one customer will show up per level with a "custom" order, but it's not quite as random as a custom order might imply - they always use some combination involving a cupcake, icing, and topping you aren't offering as part of the main offerings of the day. I spent my time trying to get expert on each level, which is what I do with most time management games. My son, who hasn't played nearly as many of these as I have, enjoys himself just trying to reach the regular goal. The graphics are pretty good in a cartoony way, and they're nice and colorful. The sound isn't bad or good, it's just there. I have a tendency to turn it down and listen to my own music, but it's not because the music is annoying. It's just because it's nothing to write home about either. One of the neat parts of this game are the recipes for cupcakes and icings that pop-up in a separate recipe book in the main menu as you complete levels. As new cupcake and icing flavors come up during the levels, the recipes for them will, too. It gives you the recipes in the combinations that the game suggests for each level, not necessarily the ones you might end up choosing, but just like any cake/cupcake recipe out there, you can certainly use whichever cupcake with whatever icing if you actually do make them. Ultimately, this is a fun game for anyone who enjoys time management games. It's not one of the most challenging ones out there, but it's a solidly enjoyable one that isn't too easy either and has some customizable features that make it more than just the same thing over and over. 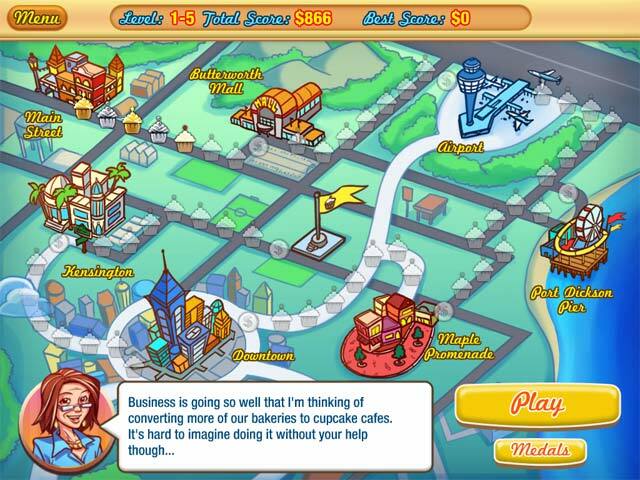 I'd recommend it to any fan of time management style games! Help Jessica transform her aunt's failing old bakery into a complete success. Get Jessica's Cupcake Cafe up and running!